Plan a Shimla Kullu Manali honeymoon package for couple today, if want to explore the abundant nature beauty of Himachal Pradesh. If you plan to choose one of the honeymoon tours in North India, you can make this journey more special with our Shimla Manali Honeymoon Package. Here, we offer Shimla Kullu Manali honeymoon tour guide from Delhi with all travel specifications like couple cost estimate, duration, pick-up & crop point, sightseeing, and destination information of the package. So, you can pick the right one package that perfectly match your needs and budget. You will be welcomed by our representative from Delhi station or Delhi airport. You will straight away head to the Queen of the hills i.e. Shimla. Check in at the hotel freshen up and stroll around the Ridge the fieriest place in Shimla. Come back to the hotel after a long stroll gorge upon some scrumptious food and go off to sleep. Next day would be an engaging day for you. In the morning after gorging upon some luscious breakfast you will straight away head for your trip which would include trip to Kufri, Fagu, Naldhera and Chail. Kufri- It is the hub for winter sports in Himachal. There is a place known as Kufri amusement park in Kufri. Believe me this place can make your day. It has the world’s highest go kart track in the world. You can go for ice skating and skiing which can for sure give you an adrenaline rush. Naldhera- A perfect place of how a Golf course should be this place defines it. Naldhera is a beautiful place nearby Shimla. You can stroll on the Golf course can even enjoy a ride on caddy. It is a picture perfect destination for the love birds. Chail- Before anything else let me tell you Chail is home to world’s highest cricket ground. Do not even think of missing out on the cricket ground. Love Birds can even enjoy a trip of Horse Riding. After a tiring day you will be guided back to your hotel. Have a gala dinner. Have proper rest next day be ready to travel to the Valley of Gods. After having some lip smacking breakfast you will straight away head to the valley of Gods i.e. Manali. Trip to Manali from Shimla can turn out be one of the best trips of your life. You cannot afford to miss the scintillating scenes from Shimla to Manali. Honeymoon Couples can even take some wonderful pictures during the road trip. After reaching your bourn you will check in to your respective hotel. Have gala dinner then relax your bodies and be ready for a wonderful day tomorrow. This day will be dedicated to Solang, Kothi, Rahala and Gulaba. This day will turn out to be a thrilling sport activity day for you. Solang Valley- It is a place popularly known for adventure activities. Among all the activities Paragliding is the most famous activity in the place. Solang valley is a treat for the adventure sport lovers. Kothi- It is situated around 12 kilometers from Manali. The Kothi village is one of its kinds. From the village you get a beautiful view of the mountains. People who love camping and are looking for a place Kothi is the place for you people. Rahala falls- It is basically a waterfall which you will get when you are on your way to Rohtang Pass. It is a beautiful place which can make your day. Honeymoon Couples can enjoy their hearts out in the waterfall. Gulaba- It is a place which is covered with snow all over the place during winters. The place is a substitute for Rohtang Pass in the winters. Here also you can enjoy some winter sports. The scenes in Gulaba are something to cherish about. After an engaging adventure activity day you will be headed back to your hotel. Have your dinner and go off to sleep so that you get proper sleep. Next day it would Naggar, Kullu, and Manikaran. After stuffing yourself with some heavy breakfast you will head to Naggar. A sizzling town in the Kullu district, the town is embedded with mountains, waterfalls, etc. Another thing that adds to this town is the rich cultural heritage of the town. Kullu- It is a beautiful destination which offers you peace and satisfaction. Honeymoon couples should not miss out on this destination. Kullu is a major place as we have to enroute while visiting Manikaran, Rohtang pass and many other places. Manikaran- It is small town which is revered by both Hindus and Sikhs. The place is eminent for its hot springs also. All over it would be a wonderful experience if one visits here. So this would bring an end to day 5. Come back to your hotel eat and rest because next day is dedicated to the temples. It would be the last day of your trip. All’s well that ends well. So in order to justify the saying, last day has been dedicated to the temples. The temples are Hadimba Temple, Manu Temple, and Vasisth Kund etc. Manu Temple- It is a wonderful temple dedicated to sage Manu who was the one who created the world. Beas River is also situated nearby the river. Vasisth Kund- It is said that the temple is around 4000 years old. It is a beautiful temple which can give you inner satisfaction. So with this your dream comes to an end. It would be a beautiful end to the trip. After visit to some amazing temples you will board Volvo to Delhi. This sweet and memorable trip will mark its end. Do not forget to treat your eyes while traveling from Manali to Delhi. Trust me the scenes from Manali to Delhi are drop dead beautiful. After reaching Delhi you will guided to Delhi Railway station/Delhi airport and you will be back home with some sweet memories and crazy experiences you have had. Honeymoon couples trust me Himachal is the best place to start off your new life with utmost joy. Honeymooners can have the best time of their life in Himachal. So do not wait for the perfect book your packages for Manali and Shimla and feel the magic to be in Himachal. Shimla Kullu Manali is an attractive destination with much to great opportunity offer, but weather conditions make any part of the season win over others. The best time to visit Manali is generally during the months of summer and autumn, between May and October, except the monsoon season coming in July and August, when rainfall patterns perpetuating landslides. The summer months (May and June) receive maximum tourist influx in hill station Manali and is a great time for holidays or honeymoon trip. Summer Season: Summer or pre-monsoon season in India, lasting from April to June (April to July in Northern India). And temperatures average around 32–40 °C in most of the interior (10°C to 25°C in Himachal Pradesh). Snow can be viewed only at very high altitudes like as Kufri, Rohtang Pass or Leh. Monsoon Season: The main monsoon season in India, which lasts from mid-June to September (July and mid-September in northern India). Monsoon rainfall starts to recede from Northern India early in October. Southern India usually receives more rain. It is absolutely not the best time to visit Shimla Manali as due to mudslides from heavy rainfall are very common here. Winter Season: Winter season in India, lasting from November to February. December and January are the coldest months, with mean temperatures of in Indian Himalayas. There is a huge variation in the climatic conditions of Himachal Pradesh due to variation in altitudes. And temperatures average around 16 to 21 °C (61 to 70 °F), and nighttime temperatures average 2–8 °C (36–46 °F). 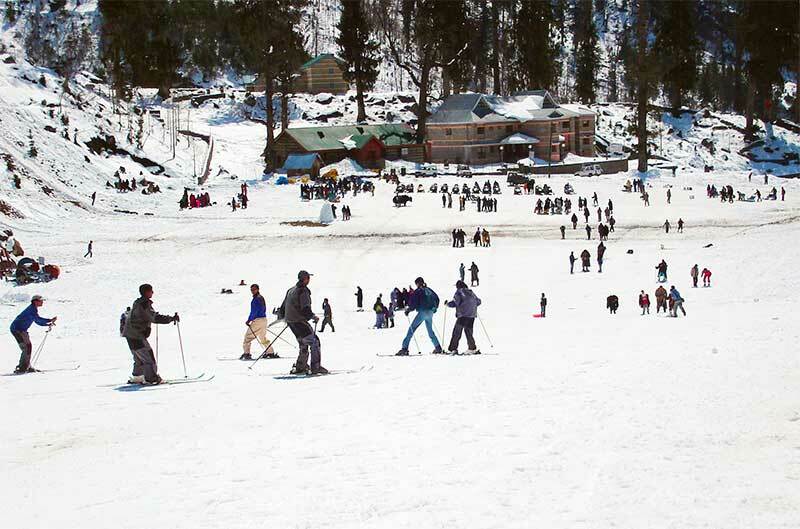 November and February are best to come for winter activities like skiing and ice skating in Manali. Snowfalls and landslides are conducted in the quaint hill station of Manali during winter months. Visitors are encouraged to take the heavy wool – suit when to visit the mountain resort in the winter time shooting the cool climate in order to avoid freezing. 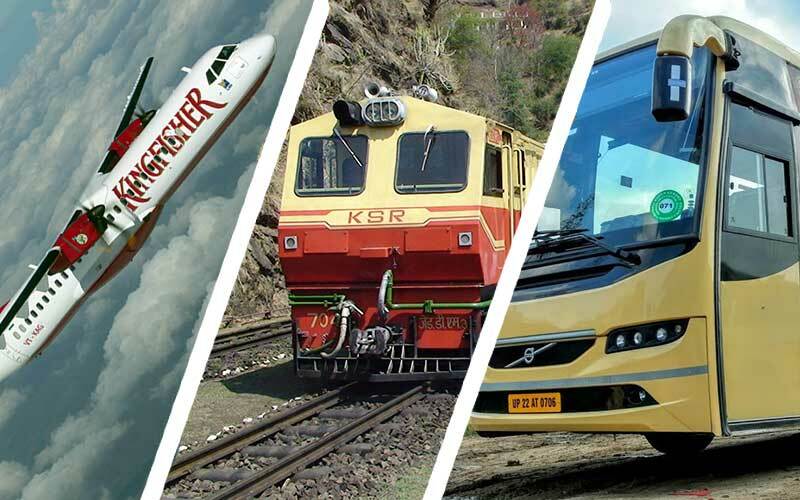 From Delhi to Shimla Manali you can travel by air, train or road. The train is available up to the Kalka station after that you can travel by toy train or by road to Shimla. There are plenty of day/night Volvos available from Delhi to Shimla and Kullu – Manali. There are three domestic airports Gaggal Airport (Kangra), Shimla Airport (Shimla), Bhuntar Airport (Kullu) in Himachal Pradesh. Shimla Airport is located 17.2 kms in the region of Jabarhatti which is about 23 kms from the town. The air distance between New Delhi and Kullu is 333.77 kms. Gaggal Airport is located at a distance of 13 kms from Dharamshala. Honeymoon is the most exciting part of the wedding celebrations, when the marriage celebrations is over. A honeymoon is a special occasion when the newly married wife and husband get closer and intimate with each other. It would be not wrong to say that each partner needs to make their honeymoon on a perfect time. Traveling, it has always been fun, but the marriage brings lots of drama, comedy and tragedy in life. The excitement of exploring new sites, check out new stuff, meeting new people is what life around. However, prior to undergoing a great variety of these flavors, why not to catch the first trailer, with some elements of fantasy? Well, every couple must get to taste the good aspects of getting married in their honeymoon. Newly weds women have double the tension of a honeymoon. Why? Because not only they have a need to gorgeous at all times when on a honeymoon, they have to become accustomed to the new person in their life. Therefore, here are some honeymoon tips for newly married couple that may help you make your honeymoon so special, that you”ll be pleased he/she made the right decision to say “I do” to your special one. Time – Best Time for Honeymoon: This is one of the basics tip honeymoon traveling. It is important to know, what is the best time to honeymoon in India? In this case, whether you are considering going directly after the wedding, make sure you”ve packed your bag and other details are maintained. If it is overly feeling tired and stressed, consider traveling after just a few months after your wedding. Travel Light – Pack Light Bag for Honeymoon: This is the second most honeymoon touring tips, what to pack for a honeymoon? No matter where you travel for honeymoon in India, in case of traveling with a heavy bag, always you will face problems, especially during transit. At your honeymoon, it needs to being relaxed, be soft. So, start by packaging or keeping a light bag is with you so that it can move and carry easily without having to fight. Honeymoon Destinations – Get A Place That Both of You Like: If you are a newlywed couple, or have no idea about the best place for honeymoon in India, then pick a place that both of you will like. Plan out your honeymoon wisely according to your desired destinations like honeymoon in Manali, honeymoon in Kerala, honeymoon in Goa etc… so that both of you experience the same level of excitement and convenience when you go there. Importantly, make sure that you have led to important documents for your honeymoon as the country license and passport etc. Take a look at few the best advices for your honeymoon that you must try out as a couple. To cover your travel expenses, DON”T rely on wedding gifts. Point of a spontaneous activity which would you don”t normally do; that will make your trip worth remembering! Take around the clock to enjoy the honeymoon or destination (a weekend of four days is much time to rest and relax). If it rains, or the tour is canceled and you expect nothing or something else happen on your honeymoon trip. Do not let them the small stuff ruin your incredible experience once in life. Keep your wallet and cash in a safe & a secure place after getting out on a trip. Pick something that will going to love to wear on your honeymoon night. Play a game of conversation, or get to talk about interesting topics. Be romantic. Play music. Drink champagne. Watch together the sunrise or sunset, it brings in a sense of new beginning and a fresh start for the newly-married couples. Leave your cell phone, or keep the ringer volume to low. Do not browse the Internet. Spend this precious time with your spouse, keep this trip in a double block state confidentiality, just the two of you truly know. Means, Facebook or any other social site does not have be in the loop on everything. Surprise your loved by order delicious breakfast in bed, plan a day excursion, and a romantic sunset walk, etc. Whether you forget something or can not do, does not feel like taking the whole tour see of? The weather could be unpredictable, but do not be completely ruined their plans. There is something about the music you hear in the planning of your wedding and honeymoon: never forgets, ever. Do not rely only on the sights, tour: get a sample of local flavor by shopping locally. Get home at least one full day before heading back to work (if possible). And last one honeymoon tips for couples is to get lovely images both of you and make a Honeymoon Photo Album to post to your loved one, who were a part of your special day. 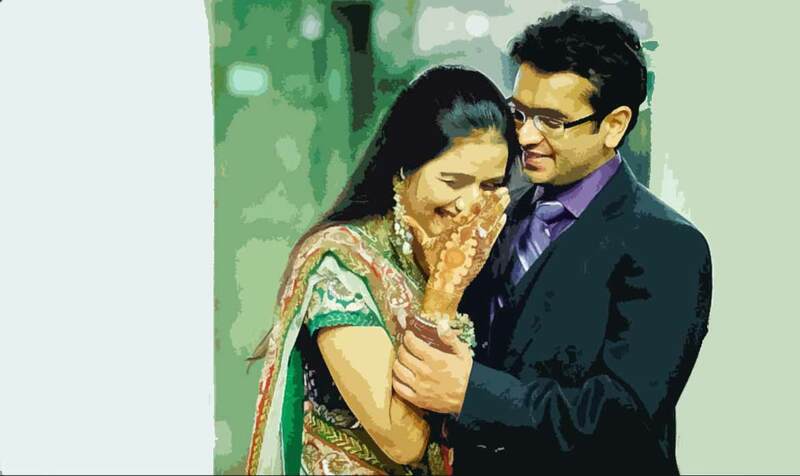 It is rightly said wherein each life partner needs to make their honeymoon a memorable moment. Nothing is particularly complicated for your honeymoon tour here—that’s the point. We offer only common desires you should ask yourself through your honeymoon planning to make sure you don’t forget anything important. Let your newly married life scale new heights with this list of interesting things you must do on your honeymoon to make the trip more romantic. These honeymoon travel tips for the newly married couple will help have a splendid time with each, and will be given a lot of good memories that you can cherish forever. Now we have a simple question for you, which we’d like you to answer by sending an email by: contact@indiavisitonline.in. Which of the best things in this article is most important for your plan a tour for a couple on honeymoon?